ProAid Office Mesh Desktop Organizer, perfect solution for your messy desk, creating an easy, orderly and neat office environment for you. 1. Wire mesh construction will keep your desk neatly organized. 2. 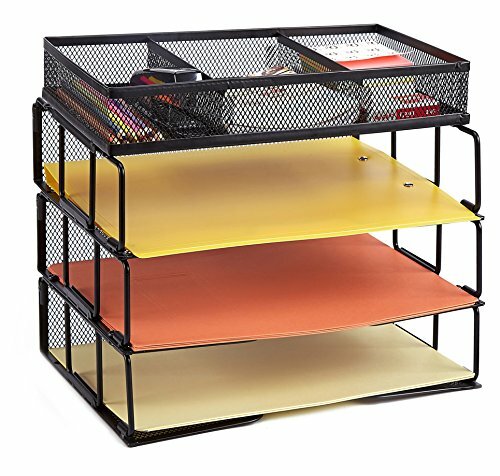 The three horizontal size file trays, it can make the most of your space with this desk organizer. 3. The popular design metal desk organizer holder, perfect desk storage that is easily accessible. 30-day money back guarantee, 1 year replacement warranty and lifetime customer service guarantee. DURABLE AND STURDY: Being made of metal mesh material, the desktop organizer has a solid construction, perfect for organizing letter sized and smaller papers. Besides, it's very easy to clean and see if anything has fallen down for this mesh design. MAKING DESK TIDY AND CLEAN: The paper organizer has 3 paper trays and 1 sorter tray, suitable for holding regular sized paperwork and paper scraps or some other small desk accessaries. Keeping your desk tidy and making things easier to find. EASY TO ASSEMBLE: It's very easy to put the file organizer together just according to the assembly instruction in the package. A good choice to keep your inbox organized by being able to sort the pending items into different compartments. DIMENSIONS: 13"L x 9.5"W x 10.75"H; Taking up a little space of your tesk, great way to organize your desk well.